Many times in student ministry we don’t get to see the full impact of what God is doing with those we work with. The following letter from a former student named Don reminds and encourages us to reach out to teenagers with the life changing message of Christ. The whole course of this man’s life was changed. Just think – your partnership with Student Venture may be touching a student, just like Don, who will still be following Christ in a great way 30 years from now. God is using you to make a lasting, significant difference in the lives of others! How exciting is that! You might wonder if this winning, building and sending works. It is an important question to ask. When I was in the States, a few people asked me if I knew what had happened with some of the first students I worked with when I joined the staff. I said I knew of a few who were doing very well and still having an impact for the Savior, but I had lost track of too many over the last 34 years. Recently, I unexpectedly heard from one of those guys from my first few years in Cincinnati – one I really enjoyed working with, but had lost contact with soon after I left there 31 years ago. Wow, it has been a long time (30+ years?). I finally found a way to reach you. I hope you don't mind. On Friday, October 8, 1976, my freshman year of high school, you took me to a football game and shared the 4 (Spiritual) Laws with me, and Jesus changed my life - for eternity. Do you remember I bawled my eyes out in the front seat? I do...and with great joy as I look back. No doubt your famous penetrating follow-up questions drove home the significance of a decision that had brought me to the arms of a loving, forgiving God for whom I had been searching. I have no repayment plan to you, but only to say, "thank you." From those first days of faith, you laid the foundation of the importance of evangelism and the Great Commission. You inquired if I thought any of my friends needed to know about Christ (it was a set up, and I knew it!). You had me make a list of those who needed to know, and prayed with me over it. You trained me how to set up an appointment and how to go through the booklet. And so, that's how we ended up on my friend, Bob's, front porch. I was so nervous, but you graciously and firmly nudged me on. Bob's life might not have been changed that day, but mine was - once again. You infected me with a heart for the lost, for evangelism and for the Great Commission. You made me actually think that God could use me to communicate the glorious gospel of grace found in Christ. You gave me a passion - a conviction - that I must be about this work. I have never thought myself very "good" at the work, and have a list of those I "should have" shared with and regret that I did not. But here I find myself today - 33 years later - taking high school students up and down Route 38 in DeKalb, IL to find groups with whom we may ask if anyone has ever taken the time to share with them the message of the Bible, etc. I have no greater joy than seeing a teenager share their faith for the first time, and rejoicing in their reaction as they see God use them. Last summer, while debriefing with a small group of our teens after an amazing evangelism moment, one 15 year old boy exclaimed, "Wow! God used me and it was so easy." I remember thinking the same thing after walking off Bob's front porch. I have seen God open doors to share the gospel in jails, prisons, a university president's office, and various places in between...and yes, even other front porches. It has never ceased to be scary, but it always amazes me how God takes our simple step of faith in a fearful moment, and blesses it so much so that we say in hindsight, "Wow, that was easy." With God all things are possible! Again, thanks for having such a profound influence in my life. I hope God continues to give you opportunities to serve and train others. One of the ministries under the Campus Crusade for Christ umbrella is a ministry to African American students called “Impact”. This is a ministry that partners with us, and other ministries, to build spiritual movements within the African-American community and among people of African descent worldwide. While our FastBreak and Getaway conferences are designed for students of all nationalities, Impact conferences are able to focus on the unique needs of African Americans. In December, some of our Student Venture staff took their African American students to an Impact conference. The story below is from one of the students who is involved in Student Venture in Indianapolis and attended the conference. We are always amazed at the various avenues God uses to turn hearts to Himself. We are thrilled and humbled that God, in His grace, will use us to do His work. While we are on the frontlines with these students on a daily basis, you are the much appreciated, behind-the-scenes support that is vital for God’s work to be done. Your partnership is never taken for granted! 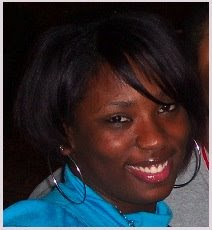 On December 27th, 2008, (the first night of the conference) I rededicated my life to Christ. Having done that, I called my mom ’cause I was so excited! Like, I was in shock! Then I had a chance to talk to all my family, and one of my aunts re-dedicated her life; she said that listening to me talk about how I’d changed and the personal relationship that I wanted to have with God made her want to change her ways. When I got back home, it was put on my heart that I needed to start something with my family. So, I started a Bible study with my family that Saturday at 10am. That day, I did everything — breakfast, the lesson plan, praise and worship, and I taught my first lesson!!!! (I’m so excited about that!!!) We now meet every Saturday with my whole family (aunts, uncles and cousins included)! I’m studying my Bible and learning to teach others, and I owe it all to God! Here is a short music video showing life with our kids, Cooper and Benjamin. I imagine that many of you are feeling the ill effects of the snow and ice; we pray that God will work in your circumstances for your good and His glory. A very integral part of our FastBreak and Getaway conferences is the well-planned outreach opportunities for all the students to share their faith with people in the local community, such as sharing on the beach, at a mall, in neighborhoods. This is a great step of faith for many students, and they are greatly encouraged when they see God work in the hearts of people they talk to. They are also encouraged to hear the victory stories shared by their peers at the conference’s evening session. Below is a story about students meeting people’s physical needs and also being used by God to meet their spiritual needs. Thankfully, God uses our plans and the willing hearts of students to do His good work. Thank you for being part of God’s good work! 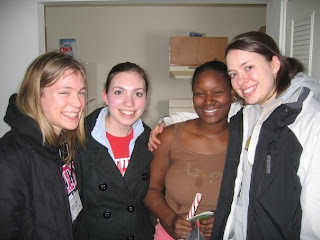 On the Sunday afternoon of our FastBreak in Kalamazoo, MI while half the group went skiing, the other half visited homes to give out our Boxes of Love (food and gifts) and to pray for people. I was so proud of the three girls I went with! Carly shared her testimony and God's love with Jessica (in brown). Julie and Grace prayed for Sarah, who is still displaced from Hurricane Katrina and going home next month! Then at the last apartment we went to, Bernard opened more than just the front door—he also opened the door of his heart to Christ as well! God is the one who does everything in a person’s heart, yet it was easy to see that the girls were awed that God could use them as they stepped out in faith. What is more exciting in life? !